We recently added a new outdoor exhibit. This exhibit is a mock-up of Razorback's watertight hatches that visitors climb through as they tour the submarine. The dimensions of this replica are exactly the same at the hatches inside. We also have a mock-up of the deck hatch for visitors to stand in. Although it lacks a ladder to climb down, it will give our guests a preview of what they will see on deck. We hope that these mock-ups will allay some of the concerns that our visitors occasionally have about navigating into and through the submarine. The mock-ups have proven to be very popular already. We have added four new submarines to the museum store. These are highly detailed, pre-painted and assembled 1/700 scale replicas. They will look great on your desk at home or work, or on the shelf wherever you relax at home. USS Gato (SS-212) - 1941 version. This model shows the famous submarine in her "as built", peacetime configuration. The high "fairwater" was quickly modified once the U.S. entered World War II. USS Gato (SS-212) - 1944 Version. This model shows Gato in her more familiar wartime configuration. The peacetime "fairwater" has been cut down to almost nothing, making room for more anti-aircraft guns. This is also very close to what USS Razorback looked like when she was originally comissioned in 1944. USS Los Angeles (SSN-688) - This model shows the modern, nuclear powered submarine of today's Navy. These submarines have formed the backbone of the modern "Silent Service" for many years now, and will continue to serve for many more. USS Seawolf (SSN-21) This is a highly detailed model of one of the most modern submarines in the U.S. Navy today. 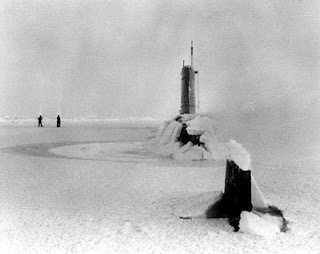 Fifty years ago, USS Skate (SSN-578) became the first submarine to surface at the geographic North Pole. This feat built upon the pioneering work done by USS Nautilus (SSN-571), the world's first nuclear powered submarine, when she crossed the North Pole while submerged just the year before. The Arctic first became an area for active submarine operations during World War II. German submarines discovered that ducking under the ice after an attack allowed them to escape detection from surface ships and even aircraft. During the Cold War, Soviet ballistic missile submarines, with the deadly payload of nuclear armed missiles, were specifically designed to "punch through" thick Arctic ice in order to fire their missiles. This made it imperative that American attack submarines be capable of effectively operating under the same ice, in order to follow and track, and if necessary, attack and sink, these submarines. Skate would make history again in 1962, when she rendezvoused with USS Seadragon (SSN-584) at the North Pole, one of the few times that two submarines surfaced at the pole at the same time. Wilf Blum of Deep Blue Marine will be speaking at the Jacksonville Military Museum on Thursday, March 19th at 6:00 p.m. Admission to the lecture is $2.00. The museum is at 100 Veterans Circle, just off Main Street in Downtown Jacksonville. Some of the company's work includes the excavation of Scipion, a French 74-gun ship that ran aground on October 18th, 1782 in the Dominican Republic after a battle with English warships. Scipion was one of the French warships sent to the American Colonies to assist the American forces during the Revolutionary War. She was involved in the Chesapeake Bay Blockade of Enlish forces in August and September of 1781. This blockade led to the surrender of English forces at Yorktown, VA and, ultimately, American victory and independance. Did you know there is a large turtle in Downtown North Little Rock? This turtle (along with a plaque with that quote) sits next to a park in downtown North Little Rock, not far from the museum. It is dedicated to Terence Renaud, the long-time CEO of Twin City Bank.